Where: Stockport Market Hall, SK1 1EU. How much? : £1 entry, under 12s FREE. It's Les Paul's birthday today! 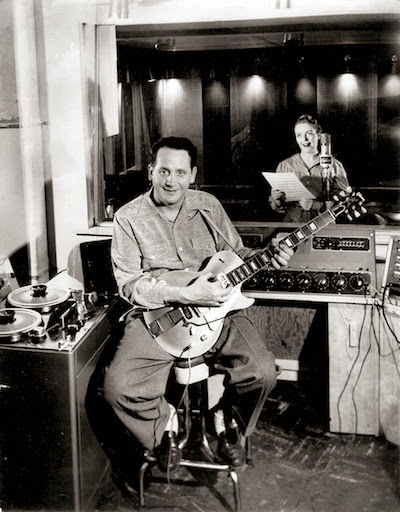 Not only an influential jazz guitarist from the 1930s onwards, Les Paul was an intrepid innovator in recording technology, plus he was one of the pioneers of the solid-body electric guitar with his famous Gibson Les Paul launched in 1952. ★ A rock'n'roll set from DJ Jamie El Muerto, back by popular demand! He says he'll be bringing along some of his dancing pals who fancy a jive! 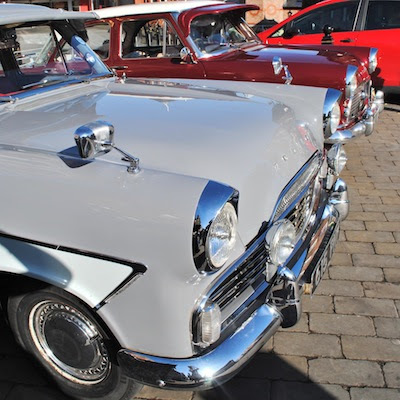 ★ Some beautiful 50s-60s motors presented by The 3 Graces Northwest car club, including a Mark II Ford Consul, Zephyr and Zodiac, a Vauxhall Cresta and a prize-winning 1956 Chevy Bel Air! 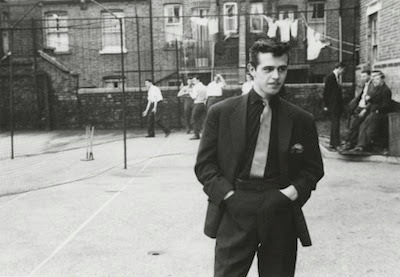 Director Karel Reisz's compelling and sympathetic documentary about the lives of Teddy Boys in South London. Although Cliff Richard is nominally the star, Laurence Harvey owns this film! A rollicking satire on the late 50s British music industry, it brilliantly evokes the sleazy hustle of Soho coffee bars, clubs and striptease joints. Arguably the greatest rock'n'roll musical comedy ever! 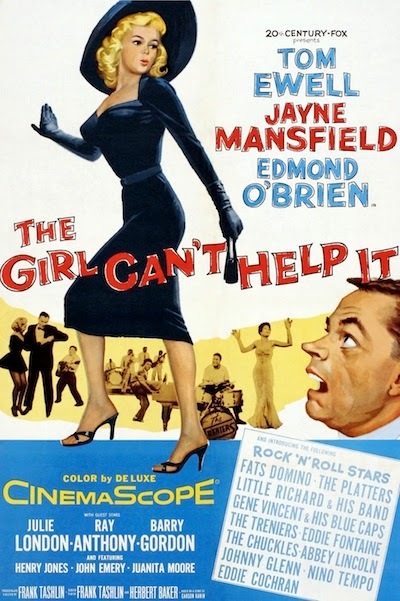 Starring the luminous Jayne Mansfield, and a host of music legends including Little Richard, Fats Domino, Gene Vincent, Eddie Cochran, Julie London and The Platters. Suggested dress code: fifties, if you please! Naturally, there will be the usual awe-inspiring array of vintage clothing and accessories for ladies and gents, jewellery, homeware, decorative items, furniture, textiles, luggage, collectables, curiosities and locally handmade crafts with a vintage flavour you have come to know and love. Once you've worn yourself out with all that intensive vintage browsing, you'll need some refreshment and refuelling. We're thrilled to welcome Caarma Curries for the first time, offering traditional Bengali cuisine and Asian dishes (menu below). The multi-award-winning Lord of the Pies will be on hand with their gourmet British pies made from locally-sourced ingredients. All your espresso-based coffee needs will be catered for by Kandoo Mobile Coffee. And for afters, Stuart Thornley Cake Design - purveyor of the finest sweet treats known to humanity - will spoil you for choice! THIS IS THE SECOND BEST BEEF PIE IN BRITAIN, OFFICIAL! UPDATE! We've had a late entry booking - the awe-inspiring Ginger's Comfort Emporium will be plying their multi-award-winning artisan gourmet ice creams at The Les Paul Fair! Winner of the "Best of the Best" at the British Street Food Awards 2012, you folks are in for a serious treat! Check Sunday's menu below. PS Let us know if you're coming along on our Facebook event page, ta! Aspidistra - vintage homeware, glass, jewellery 1920s-70s. Bedazzled Vintage - vintage clothing, jewellery and burlesque. Crank Vintage - on trend vintage clothing and accessories, lots of bags, lots of 60s! Hotchpotch Antiques & Collectables - vintage homeware, clothing and collectables. Ivy & Co - range of vintage and design goods, 1950s-70s. Jackal Threads - men's vintage clothing and accessories 1940s-80s. Justjewels4u2 - exquisite vintage jewellery (including plenty of genuine Lea Stein), buttons and postcards. Mama J's Vintage Goods - vintage fashion and homeware, 1920s-70s. Birthday boy Les Paul with his wife Mary Ford. Source. Top of the bill for our Movie Matinée Rocking TransAtlantic Treble Bill! On show downstairs in the Produce Hall. Source. We're hoping to see a few of these beauties, courtesy of The 3 Graces Northwest car club. Fingers crossed! Photo by Frankie Cooksey. We Are The Lambeth Boys, a 1959 documentary about South London Teddy Boys, on show at 11.00 am. Source. 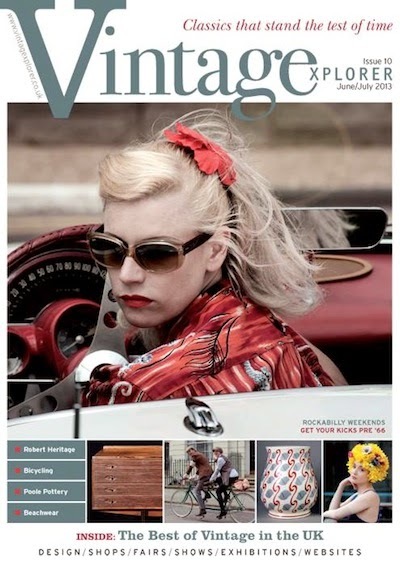 The new issue of Vintagexplorer has arrived in time for The Les Paul Fair! Pick up your FREE copy at Room at the Top Vintage Goods. Purple Jellybaby - handmade and vintage clothing and accessories, plus vintage homeware. Retrorags106 - vintage men's and women's clothing, bags and homeware 1940s-80s. NEW! Shabby Cheek - "wonderful things you never realised you wanted …"
Sue Booth Sparkly Things - vintage jewellery, bric a brac, textiles. Suzylovesmilo - vintage clothing, accessories and homeware; handmade clothing, accessories and jewellery from new and upcycled materials. Sweet Caroline - vintage textiles, haberdashery, homeware, clothing and accessories. T.E.A. - vintage homeware, kitchenalia and collectables, 1930s-70s. Tea for Two Vintage - vintage bric a brac, clothing and accessories. NEW! The Sun Will Shine - vintage homeware, 20th century. NEW! Thriftette - women's vintage clothing 1950s-80s. NEW! Vintage Queen - vintage homeware.